YOLO…Staying at Bedford Landings is a Must! What is YOLO? You Only Live Once! And if YOLO is true, staying at Bedford Landings is a must! Put us on your bucket list! Located in the beautiful Smith Mountain Lake area, we have many experiences that will help you build a fantastic YOLO experience! Do you like craft beers? Sunken City Brewery is the place to visit! Sunken City is a 25-barrel, four-vessel brew house, featuring a tasting room and pub, retail store, and beer garden. Located along Route 122 at Westlake Towne Center near the shores of Smith Mountain Lake, Virginia, they are 30 minutes from Bedford Landings. Check out their website to see how they named this brewery. Two friends toasting the sunset at Hickory Hill Winery. 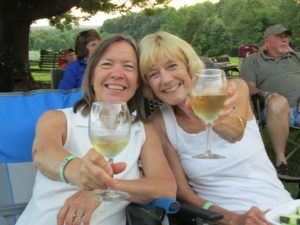 Also located in Bedford County is the Peaks of Otter winery (and we have coupons here), Seven Doors Vineyards and White Rock Vineyards. I have just learned that White Rock also brews beer! You can make an afternoon of just checking out these great locations! Staying at Bedford Landings is a must when you plan your adventure! After a full day, you can come back “home” and relax in the hot tub or chill while watching a movie in the theater room! Do you like to Adventure Sightseeing? 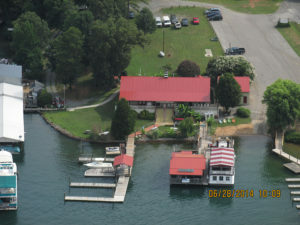 Bedford Landings Air Tours does sight seeing rides over the lake. 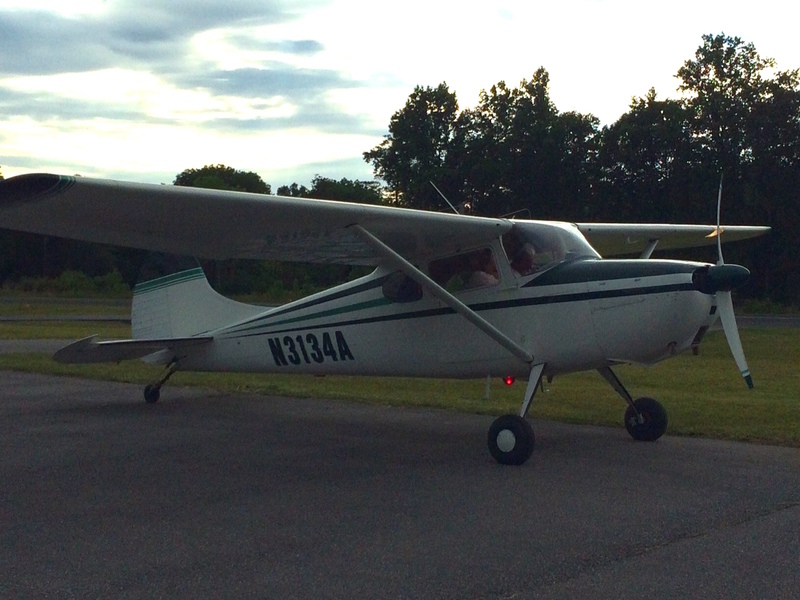 You can climb into the Cessna 170b airplane right from Bedford Landings Bed & Breakfast for this grand experience. Jack will point out interesting sights including the vineyards, the SML Dam, Bridgewater and more. 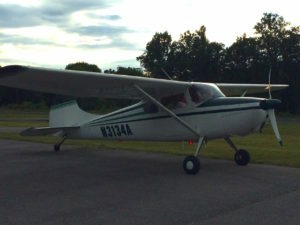 See: smlairtours.com . Do you have kids who like to look for treasure? Try geocaching! Just down load the GEOCACHE app and start the fun! My grand daughter and I did this one summer. There are may geocache near by and around SML – some even in the water! Do you enjoy just shopping and looking at cool stuff? There are many shops in addition to antiquing at the lake and in Bedford! Just a few of the shops at the lake include the Bridgewater Plaza shops, Affordable Home Outlet and the Antique Mall in Downtown Moneta; Southern Roots, The General Store, Discovery Store, and Reclaimed on Scruggs Road; the Cottage Gate, Just Made Scents, and Lighthouse Gifts and Books at Westlake; The Southern Goat, and the US Alpaca Store at Westlake Commons (across from Krogers). All are great places to pick up unusual items or just browse. How about Golfing? There are two public golf courses – Westake and Mariner’s Landing. There are also fun putt-putt courses- Harbortown Mini-Golf at Bridgwater Plaza, and Hot Shots Family Fun Center on Virginia 122. If you are staying at Bedford Landings after a day of shopping or golfing, we want to hear your golf score and see your purchases! You can come back “home” and take a nap or go for a dip in the lake at the community dock. It’s always fun to see and learn about unusual animals? 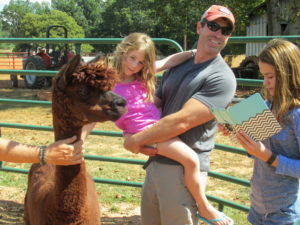 We have several alpaca farms at Smith Mountain Lake. 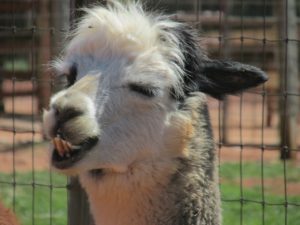 Besides alpacas, they usually have other animals such as llamas, goats, chickens, pigs and more. 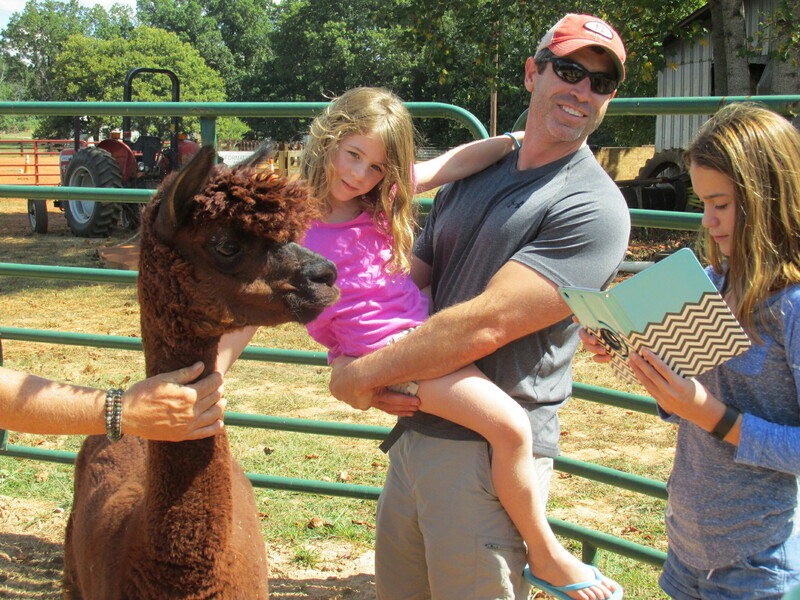 Check out Skyway Farms or Smith Mountain Lake Alpaca Farm. Both schedule tours but you need to call ahead. Do you like to hike? Both the Smith Mountain Lake State Park and the Franklin Community Park have hiking trails but if you really want a challenge, climb sharp top or flattop at the Peaks of Otter. On the way home, stop into the Peaks of Otter winery or Gross Orchard. Do you like the water sports or boating? That’s what this lake is primarily used for! You can rent a boat, rent a jet ski, paddles boards (sup2go.com) and wake boards! Cruising on the Lake – Just enjoy the scenery, a meal and a cold beverage while the captain moors the boat. The Virginia Dare, a 63-foot replica of a 19th Century side-wheeler, offers lunch, dinner, and themed cruises. It’s a great way to see the lake. And they are 3 miles from our house! 540-297-7100. 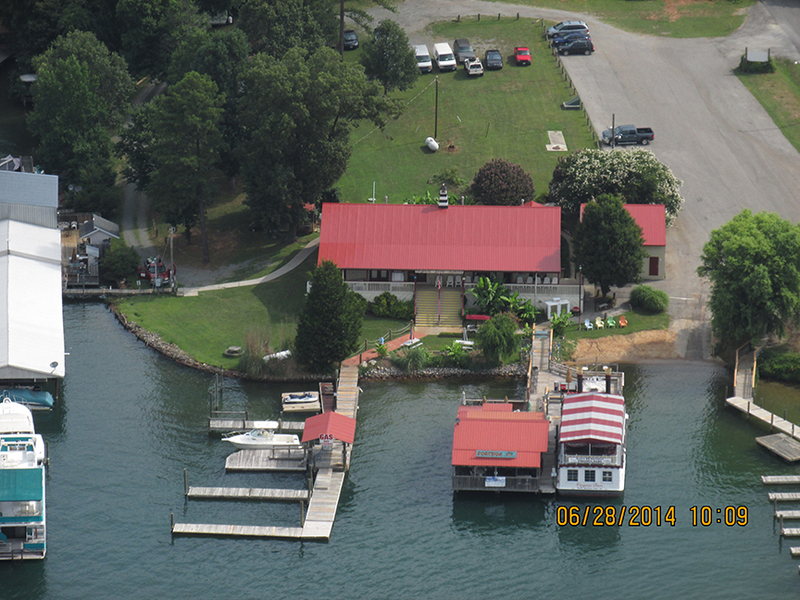 I too this photo from the air showing the boat (striped roof), Tiki bar to the left and their gift shop. Staying at Bedford Landings is a must after your day trip! You can come back “home” and sit on the deck and enjoy a cool beverage or play a game of horse shoes or corn hole. We have several guides on the lake in addition to some good local fishing spots for those with a Virginia Fishing license! 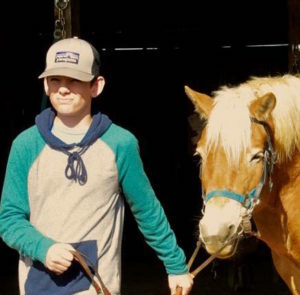 Do you enjoy horseback riding? One of our favorite places is Spring Valley Farm. The rides are reasonably priced and the horses are gentle! Staying at Bedford Landings is a must because you only live once! YOLO! There are even more adventures awaiting! We have a mouse hole! Gotta see it!